The new NBA Jam may be set in the present day, but that doesn't mean every player in the game is on a 2010 NBA roster. 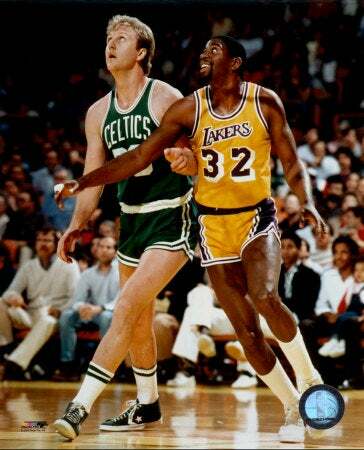 Two in particular stand out: legends Larry Bird and Earvin "Magic" Johnson. Yes, pitched at those aged 30 and up, the game will include a campaign mode which culminates in a match against Bird & Johnson, who presumably will be playing with their 1980's bodies and skillsets, not those of 2010. Old-timers like myself will remember that the original NBA Jam let you play as non-ballers like Bill Clinton and His Royal Highness the Prince of Wales.